As a recent BBC article pointed out, long before anyone in California had ever uttered the term “Silicon Valley,” the nucleus of technological breakthroughs in America was situated in the comparatively quaint city of Dayton, Ohio. In the early part of the 20th century, Dayton had more patents per capita than any other US city, and many of those early inventions are still relevant to this day. In addition to the Wright Brothers’ famous flying machine, Dayton produced the cash register, the pull-tab beer can, the ice cube tray, the automobile self-starter, the barcode scanner, and many more common everyday items. Nowadays, that nickname may still be somewhat apt, but it’s no longer a compliment. The companies that once employed so much of the Miami Valley’s work force, like the National Cash Register Corporation and General Motors, have since fled the area in search of cheaper labor. 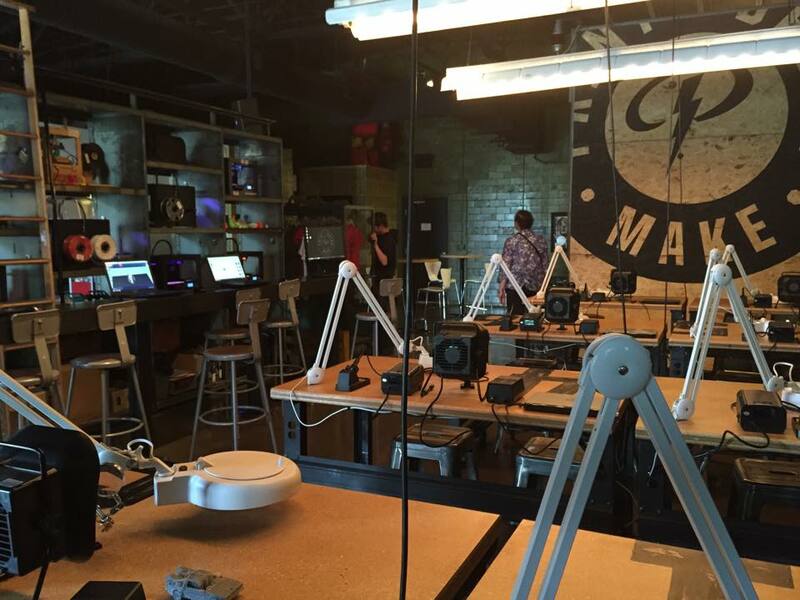 Wire’s Proto BuildBar—located a short distance from the Dayton Inventor’s River Walk, which features statues of a Wright Flyer, cash register, and even an ice cube tray—is part coffee shop, part café, part bar, and all “maker space.” For a starting price of $20, visitors can use the BuildBar’s wall of 3D printers to design, create, and print whatever they want. 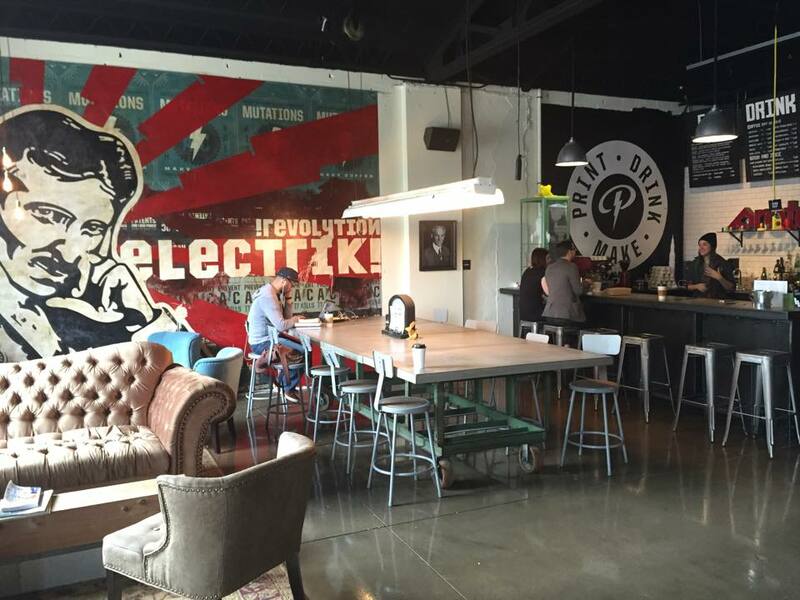 A giant mural of Nikola Tesla covers one of the BuildBar’s walls, while portraits of other famous visionaries are hung nearby. There’s a framed photograph of Wilbur and Orville Wright, of course, but there are also pictures of more contemporary innovators on display, including Steve Jobs and Tesla Motors CEO Elon Musk. 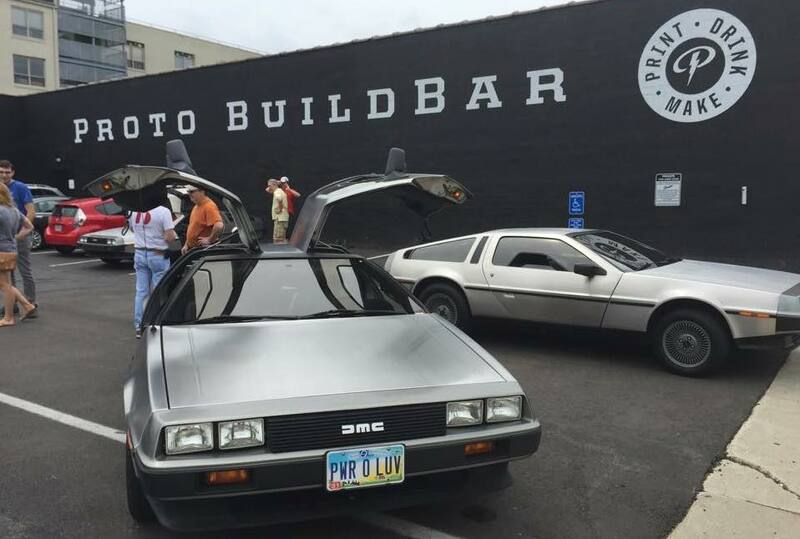 Although you won’t see his photo on the wall, the BuildBar is still the perfect place to celebrate the iconoclastic spirit of legendary automotive designer John Z. DeLorean. 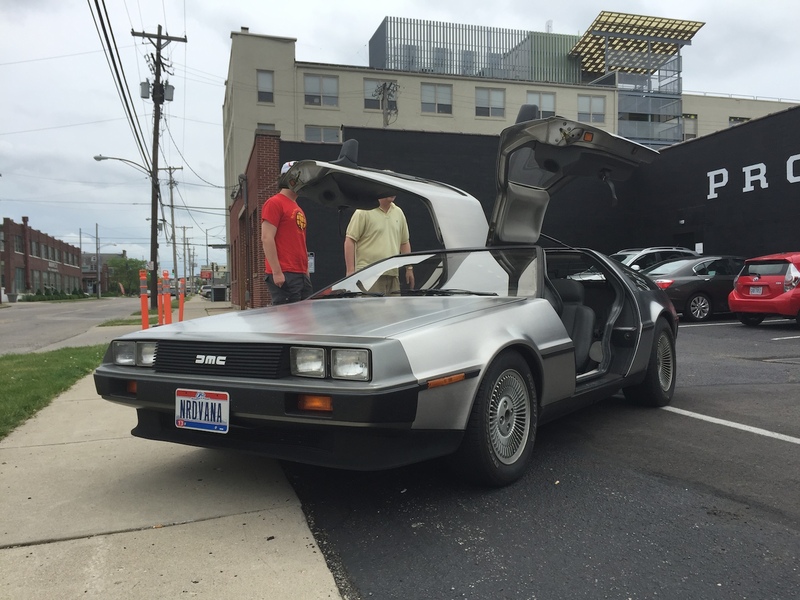 And that’s one of the reasons why a few members of the DeLorean Club of Ohio chose the Proto BuildBar as the spot for a small meet-up this past Saturday, May 16th. 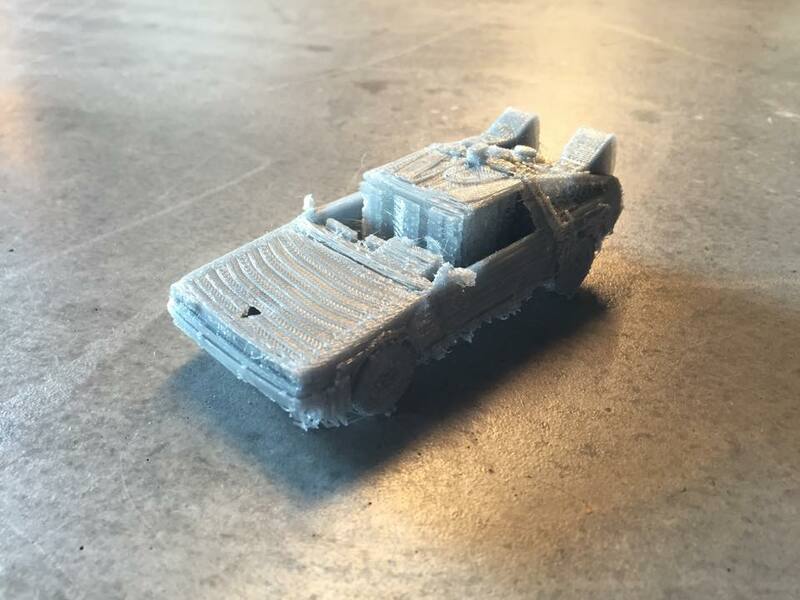 The DeLorean Club actually discovered the BuildBar when one of its members prototype printed some of the parts he’d designed for his DMC-12, to see how they would mesh with the original parts. Proto was all-too-excited to participate in the fun, using their television screens to screen Back to the Future (the film that made the DMC-12 famous by converting it into a plutonium-fueled time machine), and even raffling off a 3D printed DeLorean model. Doug owns his DeLorean due in part to self-professed nerdiness, and in part to family fortune. In 1985, with the DeLorean Motor Company in bankruptcy and Back to the Future a box office smash, lots of people recognized the DMC-12’s potential as a future cult car. Four years after her death, Doug learned of the car’s existence, and eventually persuaded his wife Julie to let him buy it. Since the DMC-12 had been sitting in a garage for over twenty years, it needed some work. 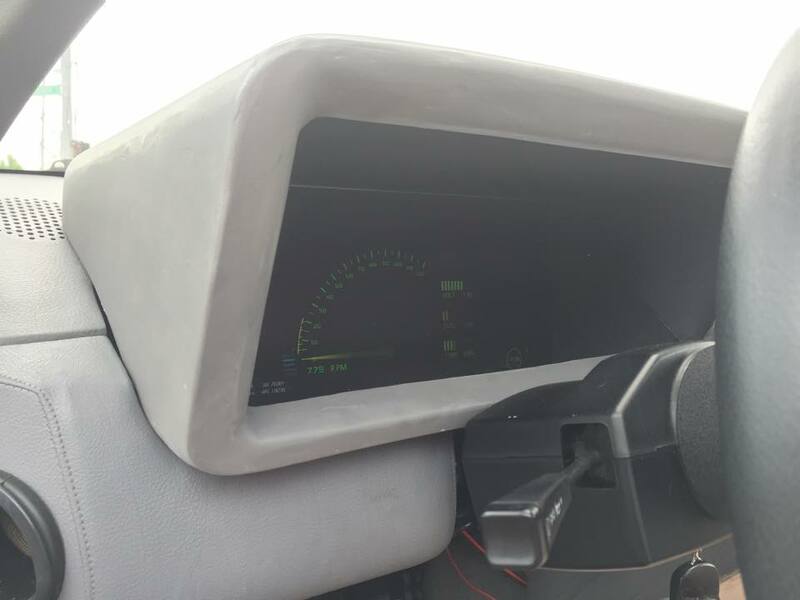 Many DeLorean owners enjoy customizing their car, whether that means upgrading the engine (a factory-new DeLorean has an unimpressive 0-60 mph time of 10.5 seconds), or installing a digital display above the steering wheel. The most common type of DeLorean personalization, though, comes in the form of vanity plates. Most owners will opt for a license plate which references the Back to the Future trilogy in some way—a tradition begun by the movie’s own iconic “OUTATIME” plates. Doug’s plates, which read “PWR O LUV,” allude to the hit song that Huey Lewis wrote for the original film’s soundtrack, but also hold a deeper meaning for him and his wife Julie. A few months later, Julie surprised Doug with the DeLorean on their anniversary. Last year, the pwr-couple won the Ohio Bureau of Motor Vehicles’ “What’s On Your Plate?” contest, proving that everyone appreciates a good love story/DeLorean DMC-12. (Second place went to a Camaro driver with less romantic “HI OFCER” plates). 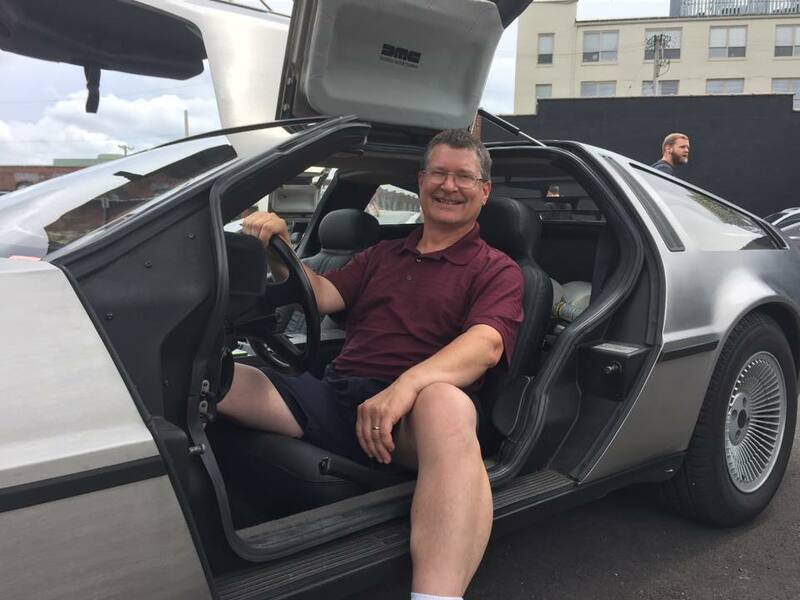 Aware that a bunch of DeLoreans in a parking lot would attract onlookers, Tesla Product Specialist Bradly D’Souza brought up a Model S from a showroom in Cincinnati, and was giving free test rides to everyone who asked. Obviously, I asked. 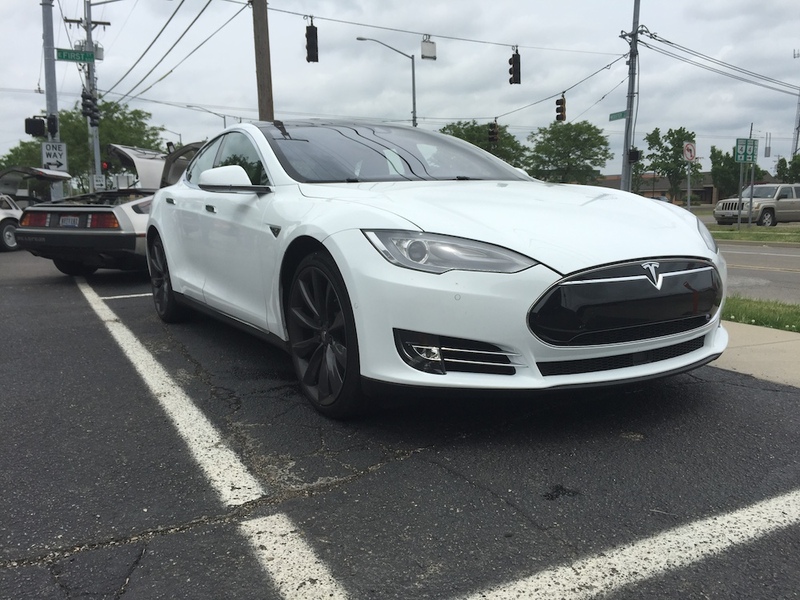 Although we were driving “the slow one” (the “fast one” being the 691 horsepower P85D), the standard 2015 Model S was still plenty impressive from a performance standpoint. 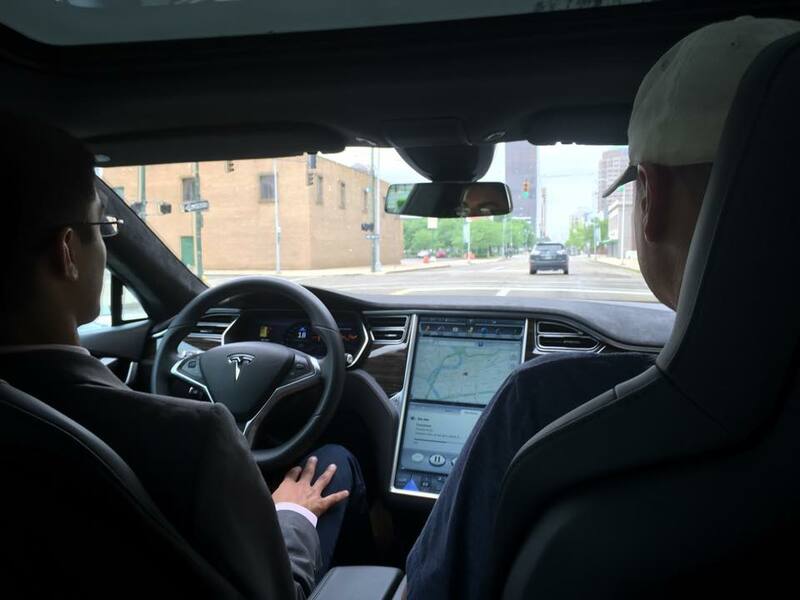 With downtown Dayton’s streets fairly empty on a Saturday afternoon, the car’s all-electric powertrain had room to accelerate silently from 0 to 60 mph in 5.4 seconds, in between red lights on East 1st Street. Fortunately, there weren’t any cops around to witness us approaching 80 mph in a 35 mph zone. I imagine that a police officer would have loved any excuse to get a better look at a brand new Tesla, whether or not it was doubling the speed limit. At least, that was Doug’s experience the first time that he ever took his DeLorean out in public. “I stopped at the gas station down the street from my house,” Doug remembered, “and as I’m filling up my tank, a police officer comes screeching into the lot and blocks my car. The officer then asked, sheepishly, if he could take his photo with it. D’Souza—who was a Tesla fanboy before he was a Tesla employee—was as infatuated with the DMC-12s as the DeLorean owners were with his Model S. There are lots of common connections one can draw between John Z. DeLorean and Elon Musk. Both are innovators who had a distinct vision, and both possessed the ambition to challenge Detroit’s Big Three with a head-turning car of their own design. One hopes that Elon Musk will have more success than John DeLorean found with his upstart car company. Worst case scenario: Tesla Motors fails to ever turn a profit, but the Model S earns for itself the same devoted cult following that the DMC-12 currently enjoys, and both Musk and DeLorean remain an inspiration to all those who dare to innovate.